We started our Easter holiday today, and had a family dinner with barbecued meat, potato salad, cole slaw, my brother's awesome tomato salad, hot dogs and... this cake. I actually aimed to make something I had done before, my frozen lemon meringue cake, but then decided to toast the almonds, alter the quantities, use store-bought lemon curd, and top it with lots of fruit.. oh, and I didn't serve it frozen. After all those changes, I figured I'd might as well give a new recipe, too. 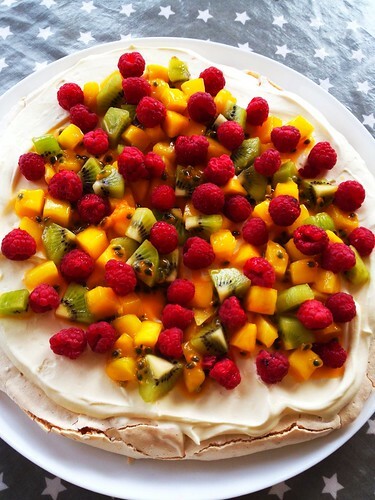 20 minutes before serving (or so), remove it from the freezer and decorate with your chosen fruit and berries. Yum! I´m not a huge fan of heavy cakes but I love these kind of ones... Happy Easter!